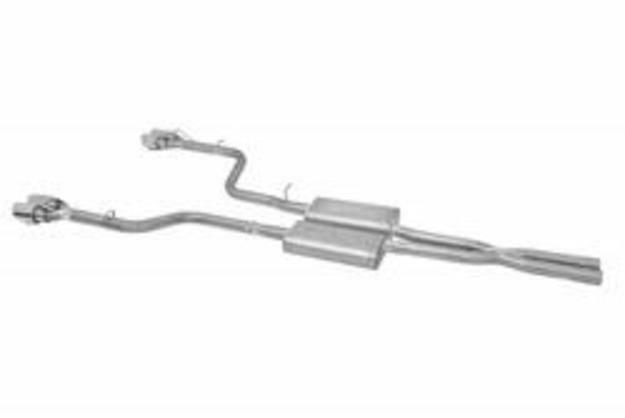 Gibson Split Rear Exhaust System 08-up Dodge Challenger 5.7L Gibson Split Rear Exhaust Polished Tips Exhaust System 08-14 Dodge Challenger 5.7L, Gibson 617012 Exhaust Kit, Dodge Challenger 5.7L exhaust System, Challenger 5.7L exhaust System,Dodge Challenger Gibson Split Rear Exhaust System,Challenger Gibson Exhaust [Gibson 617012 Exhaust Kit] - $989.95 : 3rd Strike Performance, Your Source for Late Model MOPAR Performance Parts and Accessories! Achieve noticeable power gains, a more aggressive sound, and dual exhaust looks with these Gibson split rear exhaust systems. Their design leaves you the flexibility to mount a spare tire, roll pan, or trailer hitch. The systems feature a baffled and chambered muffler to improve volumetric efficiency—plus mandrel-bent, heavy-gauge tubing for long-lasting durability.